Bothered excellence—an exuberant restlessness of mind and soul, both Fordham’s distinctive advantage and our gift to the world. At Fordham, strategic planning is continuous planning. In fall 2015, University President Joseph M. McShane, S.J., set in motion a process to set Fordham’s strategic direction for the next several years. A dedicated committee of faculty and administrators crafted A Strategic Framework for Fordham’s Future: Bothered Excellence, which was approved by the Board of Trustees in September 2016. 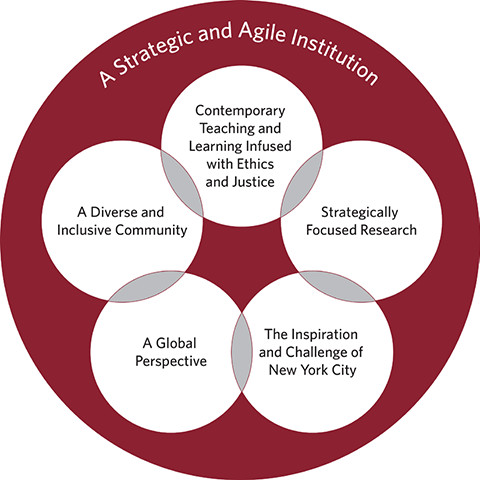 Fordham has launched the second phase of its continuous strategic planning process. The 2018-2019 CUSP Committee is charged with developing a set of initiatives to advance our strategic priorities, accompanied by budgets and timelines, for review by the Board of Trustees at its meeting in December 2019. These initiatives will be faithful to the CUSP Strategic Framework, responsive to the forces at work in the higher education landscape, and reflective of the local planning work that has been underway. Learn more about this new phase of continuous strategic planning.